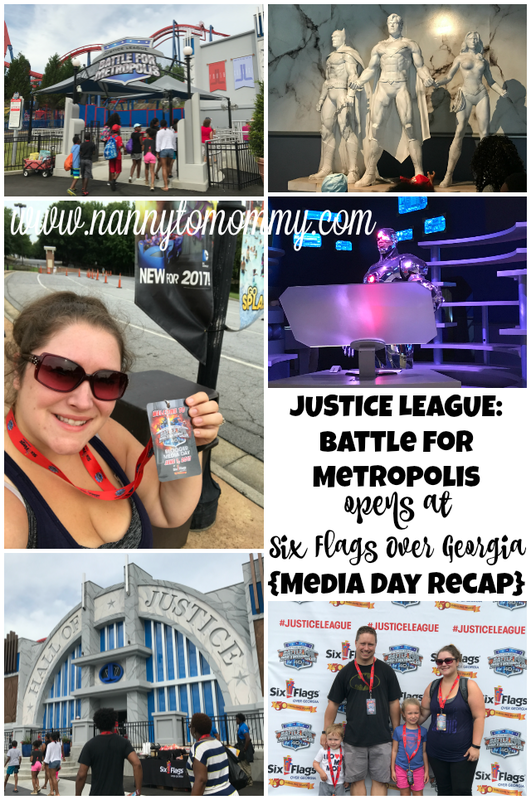 If you follow me on Instagram then you know that last week, my family and I were invited to a media day at Six Flags Over Georgia to celebrate the opening of "JUSTICE LEAGUE: Battle for Metropolis". It is the only ride of its kind in the Southeast. 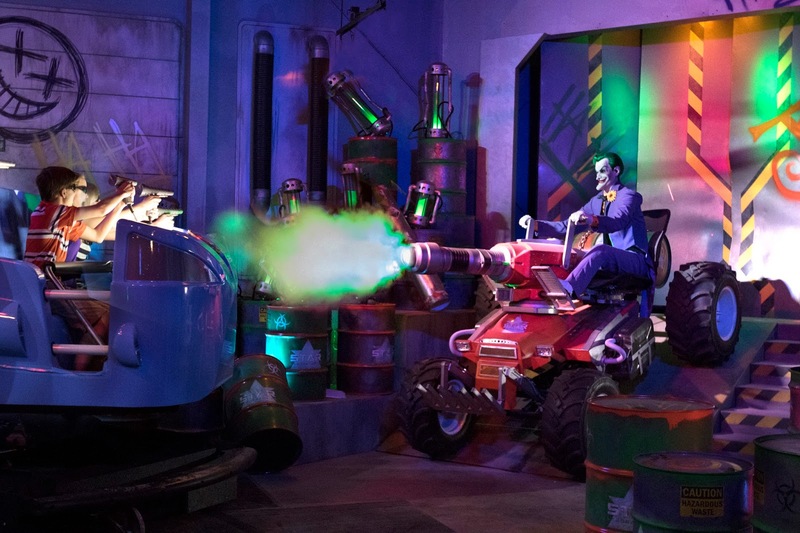 It's an indoor, interactive, action thrill ride with 4D effects for the entire family to experience together and features iconic DC Comics Super Heroes and Super Villains like Batman, Wonder Woman, and the Joker. It was also voted one of the most anticipated theme park rides for 2017! I can't even describe how excited we were for this event. This is the first event in a while that I had butterflies in my stomach. We were walked back to where the ride is, back by The Superman Ultimate Flight ride. The ride itself is indoors which makes a perfect little break from the sun. As you walk in there are TV monitors explaining that you will be able to shoot at certain "bots" to earn points. Each rider (up to six) will have their picture taken and their score will be calculated. A gorgeous statue of Batman, Wonder Woman, and Superman are in the waiting area as well. Once you walk a little further in the line, Cyborg will greet you as you enter your car and explain that The Joker is the main objective to catch, but you will have help from the Green Lantern, Superman, Batman, Wonder Woman, and the rest of The Justice League along the way. My whole family was able to ride. The entire ride has interactive screens you can shoot at, even some real life features that "pop out" at you while your car rotates and spins through this real life comic book that you are a part of. I would like to say that I won with a total of 21,000 points! I am so excited for this new high action thrill ride in 4D at Six Flags Over Georgia and think it will be a blast for years to come! After the event ended, my family and I decided to ride Superman Ultimate Flight ride and Scream Machine. My kids did not want to ride, but at Six Flags Over Georgia they have a great feature called "Parent Swap". 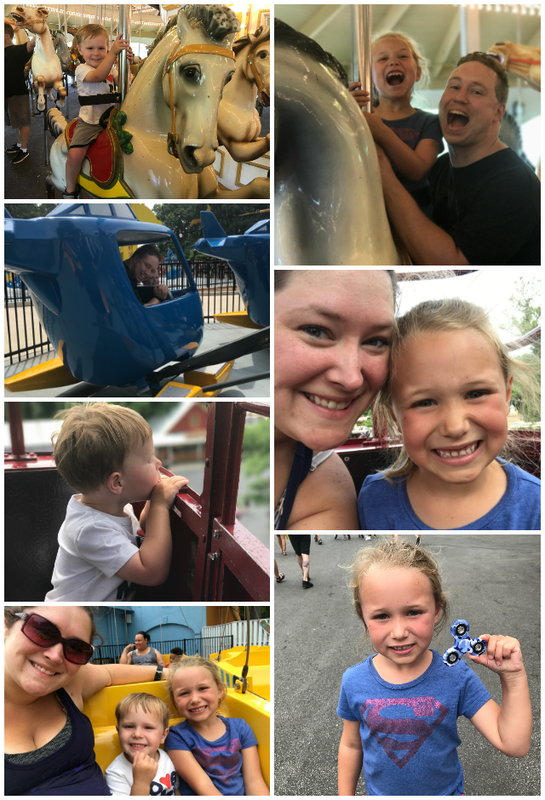 What I loved about this is that my husband and I were both able to ride more of the adult rides while still being able to enjoy having our children with us. How "Parent Swap" works is, one parent rides first while the second waits in the exit area, then they just swap! Such a cool idea! When we have went in the past, we never knew this existed and felt guilty even suggesting it for some reason. The lines weren't long, so my kids didn't have any issues waiting while the adults were able to enjoy rides too. After that we rode the classic carousel and then headed to World's First DC Super Friends park where we rode most of the rides there. Of course we rode Monster Mansion as well. Then we rode the infamous sky buckets and headed to the car for lunch. We brought our Grizzly cooler so everything stayed cold and we ate in the shade. We also grabbed our bathing suits, puddle jumpers, and more sunscreen so we could head to Hurricane Harbor for our first time ever. Hurricane Harbor is the way to go if you want to stay all day at the park. They have changing rooms and where as the res of the park you have to wear shoes and mostly clothes, in this section you can walk around in just your bathing suit. Hurricane Harbor at Six Flags Over Georgia was named the third-best Outdoor Water Park in the Country in the 10Best USA Today reader’s poll and definitely for a reason! Hurricane Harbor is a 7-acre oasis, featuring a 38,000 square foot wave pool with four foot waves and the world’s first Tsunami Surge water slide – 5 stories tall with a wave wall that sends riders perpendicular to the ground with a sensation of weightlessness, among other attractions. 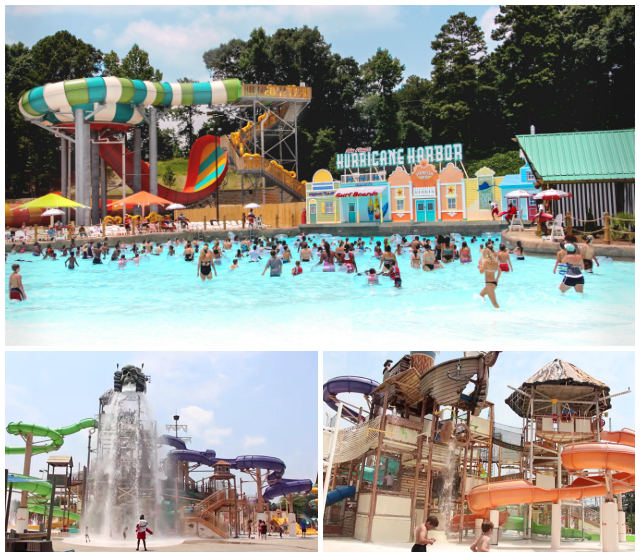 Hurricane Harbor is open daily (starting at 12 p.m.) through August 6 and weekends through mid-September. My daughter was able to ride most of the slides so my husband and I traded off while our son enjoyed the wave pool. They also have life jackets available (no extra fee) and lifeguards at every top and bottom of slides, so safety was clearly a top priority when designing this fun experience. The event started at 9:30 a.m. and thanks to the mild weather, relatively short lines, and being able to cool off at Hurricane Harbor, we stayed until 6:00 p.m. that night. We had so much fun! This was one of the best days I have had at Six Flags Over Georgia and I can't wait to go back again! What did you think of our day at the park with Six Flags Over Georgia? Do you want to experience the new ride yourself? Although my family was invited out to a complimentary Media Day at Six Flags Over Georgia to experience the new Justice League: Battle for Metropolis ride, we have loved going here since my husband and were children. I am so excited to create more memories with my family here! Looks like you love Nanny-Mommy-hood! The video sold me of how fun this park is. The kids were adorable! Two thumbs up!! I would love the Harbor Hurricane ride! It is for me! I wonder if these rides are at the Six Flags in IL? Going here is reason enough to visit Georgia! Thanks for sharing!